In a video message released Monday, the National Rifle Association called out The Washington Post for publishing “blatantly false” stories meant to portray law abiding gun owners in a negative light. The liberal media has been hammering the NRA for weeks, since U.S. liberals began falsely claiming that one of the organization’s recruitment videos was a call to violence. In it’s latest video, the 2nd Amendment organization took an opportunity to hit back at its detractors with a message from sportsman and firearms enthusiast Greg Stinchfield. The crux of Stinchfield’s message? Liberal media outlets are angry that it is impossible to back their shrieking claims about the dangers of responsible firearm ownership with any facts whatsoever, so they result to fake news and sensationalism to portray gun owners as right wing threats to civilized society. 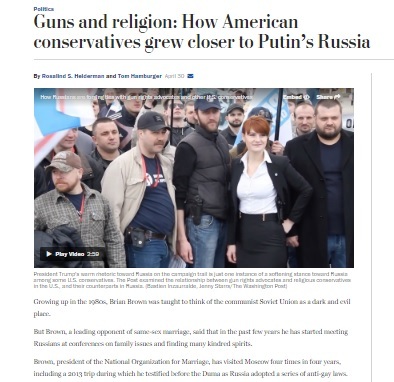 The Washington Post, Stinchfield pointed out, even went so far as to attempt to claim that the NRA is a stooge organization for Russia because of conservative support for guns and religion in both nations. At the same time outlets like WaPo attack law abiding gun owners, the 2nd Amendment supporter said, they champion lawlessness, street protests and leftist violence carried out by opponents of conservative government policies. “The Washington Post isn’t mad about the lack of guns, it’s mad about an abundance of truth — the truth about their role in the organized anarchy of the violent left by spreading lies about those who disagree with their radical agenda,” Stinchfield said. He added that WaPo and other media outlets should worry more about the number of facts in their reporting than the number of guns in the nation. Oh my, Omarosa: Secret taping in the White House?